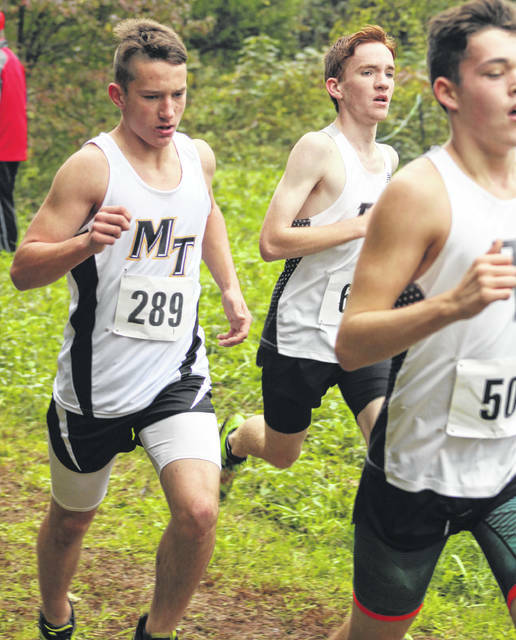 Miami Trace Panthers 2018 Regional cross country qualifiers — The Miami Trace boys cross country team placed fourth out of 28 teams and a field of 198 runners in the Division II District meet Saturday morning at Rio Grande. 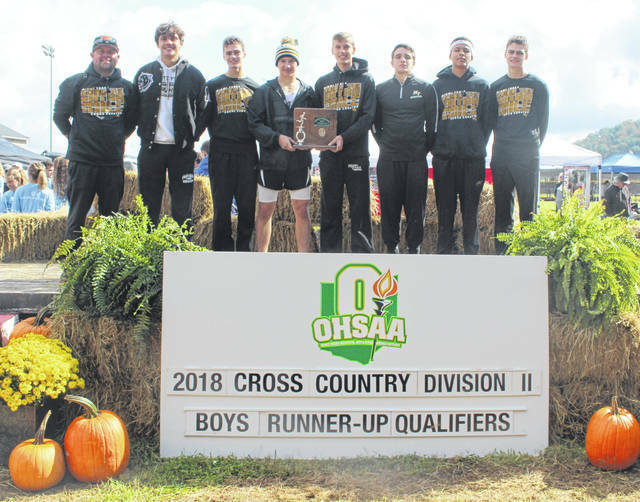 The Panthers will compete in the Regional meet as a team for the first time in school history Saturday, Oct. 27 at Pickerington Central High School. (l-r); head coach Jeff Smallwood, Joathem Lewis, Simon DeBruin, Connor Bucher, Bo Little, Mcale Callahan, Caleb Brannigan and Henry DeBruin. 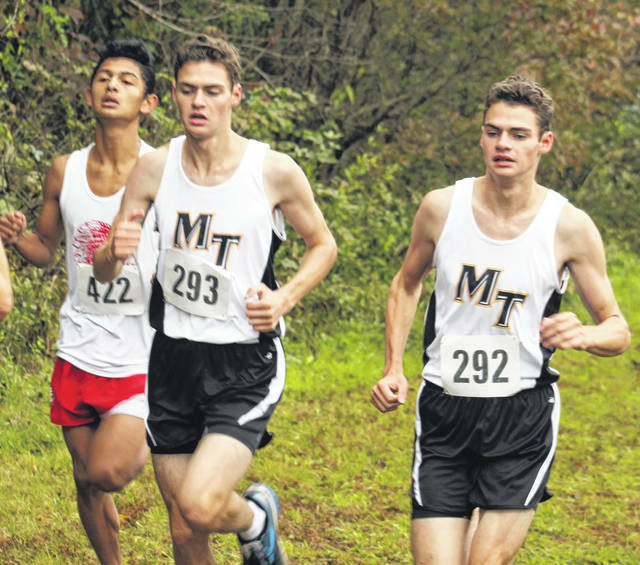 Miami Trace’s Joathem Lewis at left (294), Washington’s Kameron Morris (567) and, in behind the Sheridan runner (436) are Miami Trace’s Bo Little (left) and Mcale Callahan climbing the hill at the start of the Division II District cross country meet Saturday, Oct. 20, 2018 at Rio Grande. Washington’s Branton Dawes (572) and R.G. Crabtree (563) make their way up the hill at Rio Grande in the Division II cross country meet Saturday, Oct. 20, 2018. 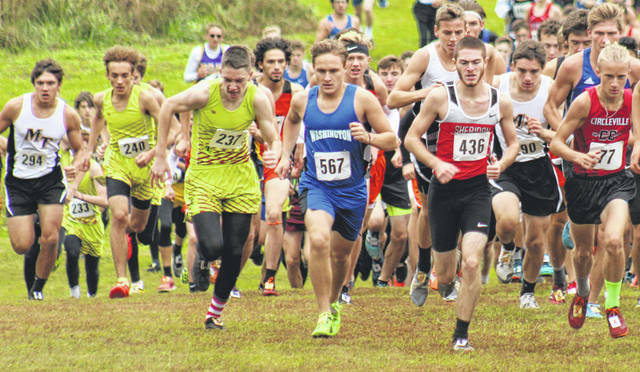 Miami Trace’s Caleb Brannigan placed 36th out of a field of 198 runners at the Division II District cross country meet at Rio Grande Saturday, Oct. 20, 2018. Washington’s Connor Lane (565) runs alongside teammate Karson Runk crossing a bridge during the Division II District cross country meet at Rio Grande Saturday, Oct. 20, 2018. Simon DeBruin (left) and Henry DeBruin of Miami Trace on their way to being the top two placers for the Panthers at the Division II District cross country meet Saturday, Oct. 20, 2018 at Rio Grande. Josh Waters of Washington High School (571) in a pack of runners including one from Hillsboro and one from McClain during the Division II cross country District meet at Rio Grande Saturday, Oct. 20, 2018. Miami Trace’s Connor Bucher (289) keeps pace with a couple of runners from River Valley during the Division II District cross country meet at Rio Grande Saturday, Oct. 20, 2018. 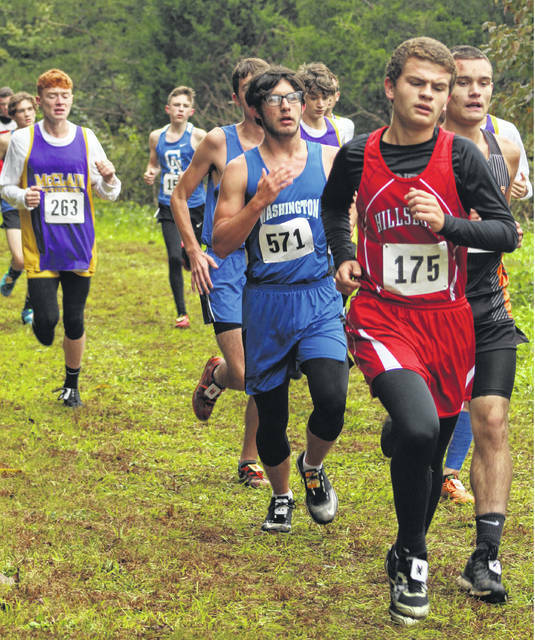 Washington’s Will Baughn competes in the Division II District cross country meet Saturday, Oct. 20, 2018 at Rio Grande. RIO GRANDE — The Miami Trace Panthers boys cross country team made program history here Saturday, placing fourth in the Division II District meet. The fourth place finish was good enough to advance the seven member team to this Saturday’s Regional meet at Pickerington North High School. 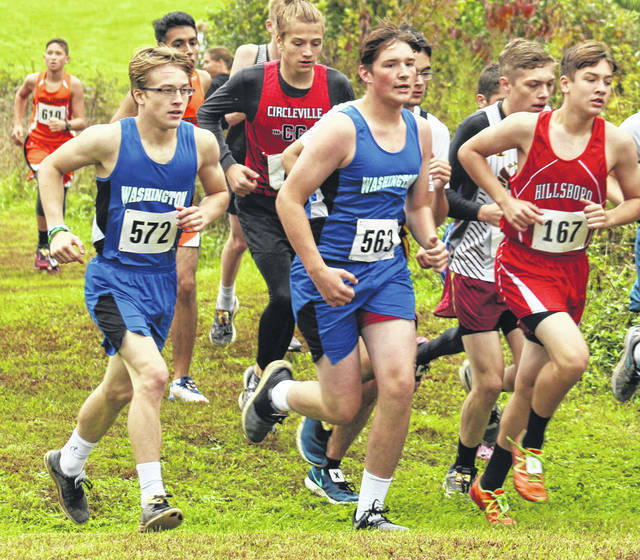 Twenty-eight schools had enough runners to post a team score at the District meet, with a total of 198 runners taking part. Unioto won with 49 placement points. They had three runners finish in the top nine. Sheridan came in second, which also counted them as District champions. They had three runners finish in the top five, including the winner, William Wilke (16:25.41). Rock Hill took third with 106 points and Miami Trace was fourth with 190 points. For the Panthers, Henry DeBruin was 23rd in 17:46.27. Simon DeBruin was 24th in a time of 17:46.28. Caleb Brannigan was 36th in 18:13.88. Bo Little was 45th in 18:29.51; Mcale Callahan was 62nd in 18:56.38; Connor Bucher was 89th in 19:47.46 and Joathem Lewis was 112th in 20:17.15. As a team, the Washington Blue Lions finished 20th with 571 placement points. Kameron Morris, a Regional qualifier last year who battled injuries this season, was the first Blue Lion to finish, placing 84th in 19:24.57. Karson Runk was 96th in 19:53.88. Connor Lane was 108th in 20:09.28; Josh Waters was 139th in 21:52.18; Will Baughn placed 144th with a time of 22:05.32; Branton Dawes was 173rd in 24:28.98 and R.G. Crabtree was 174th in 24:29.11. “Kameron has had some physical issues that have taken a toll,” Washington head coach Ryan Day said. “I’m sure he’s disappointed. I haven’t had a chance yet to talk with him. “It feels pretty good,” Brannigan said. “We had pretty high goals at the beginning of the season. We’ve been working pretty hard and we finally did it. “It wasn’t easy, though,” Brannigan said. “The course was really tough. Once you got up the hill the second time, it was pretty much mental at that point. You just had to push through with whatever you had left. 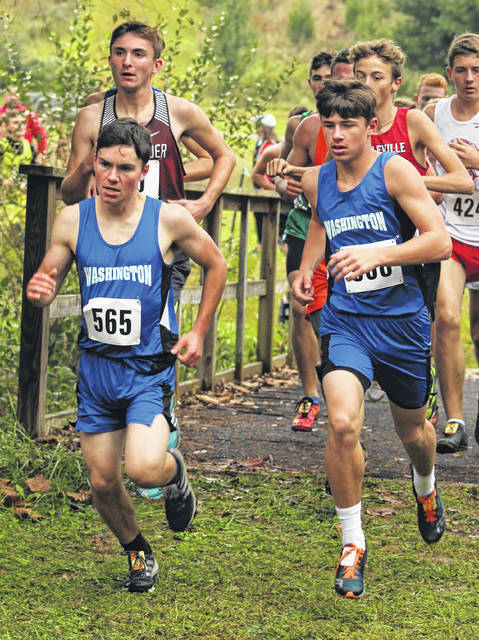 Simon DeBruin and Henry DeBruin placed 37th and 38th last year at the District. The final qualifying spot was 36th. “It was good,” Henry DeBruin said. “It was cold, so everyone ran a little bit slower than they could have, but, overall we did well. “I’m proud,” Simon DeBruin said. “I was upset last year, but, this year we made it, so, that’s cool. It was disappointing last year, but we came back and ran better this year. So, that’s good. The Division II Regional boys race at Pickerington North starts at 11:45 a.m. Saturday. Hillsboro placed 18th with 506 placement points. Bailey Lucarello was the first Hillsboro runner to finish, placing 69th in 19:05.81. McClain was 25th as a team with 685 placement points. Lyle White was the first Tiger to complete the course, placing 124th in 21:03.84. Jackson was 19th with 555 team points. Keelan Kilgour was the first for Jackson to finish. He placed 61sts in 18:53.51.